I’d like to share two experiences from January and early March, 2016 (our summer) which show how we can work collaboratively with star family, with the elemental beings, the consciousness of Gaia, and each other as sister and brother souls in human form on Earth. This series of photographs taken on January 22-23 and March 2-3, shows the interweaving of all these energies as documented by me and my friend Rob Hartland simultaneously from our two ‘viewpoints’ a few streets apart….and how he and Shelley Hartland and my energies synchronized with our star brothers and sisters, to help reduce and put out bushfires in our area on those two occasions. On the morning of January 22, I woke from a ‘dream’ featuring an aggressive dragon that appeared to be made of black smoke (and in which angelic help drove it away). 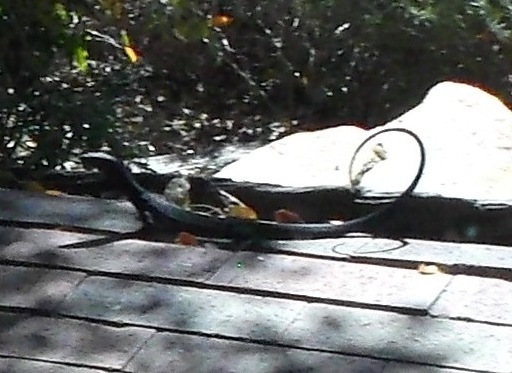 When I came out to the kitchen for breakfast, a black goanna walked past the outside door, with its tail held in a very strange position, curved up and over its back rather like a scorpion, and I heard the internal message, ‘beware of the sting in the tail’. 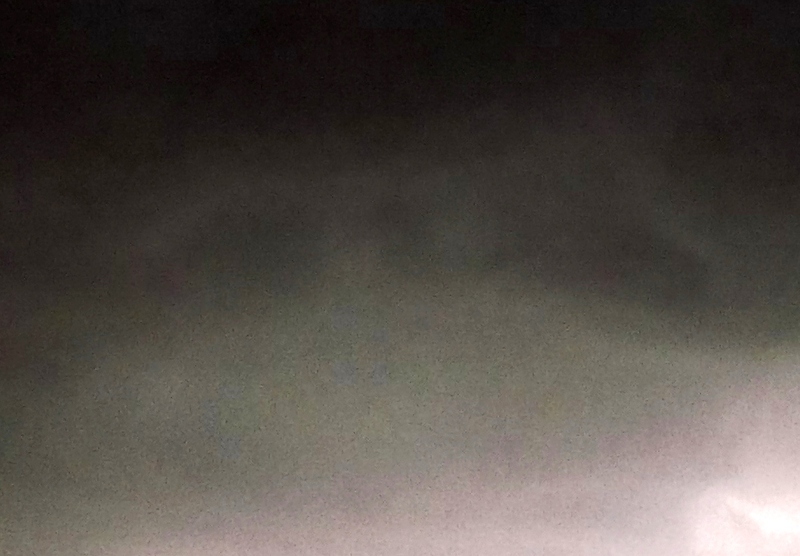 Later that day, driving home back up the hill, the black dragon’s face flashed in my inner vision, and on rounding a bend, a plume of smoke was visible, rising from the suburb I live in. 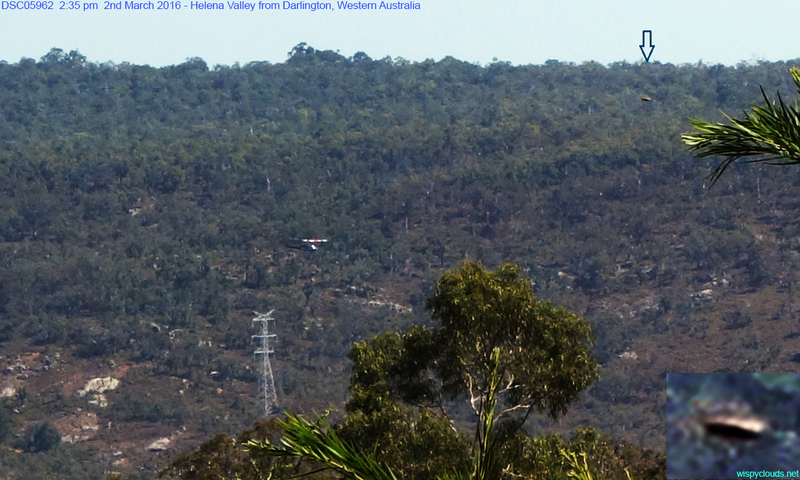 A large fire had started in the local National Park, and by the time I got home, fire engines, water-bomber planes and helicopters were arriving – in very hot conditions, with a strong wind blowing. I went into an Inner Heart meditation, put myself in the energy of peace and calm, put energetic protections around my home and then spread it out around our whole neighbourhood. Then connected with Gaia and the sylphs (air elementals) and asked for the wind to drop, and held the vision of the flames reducing down to the ground, the fire being put out. I walked outside and called on star family for help with containing the blaze. 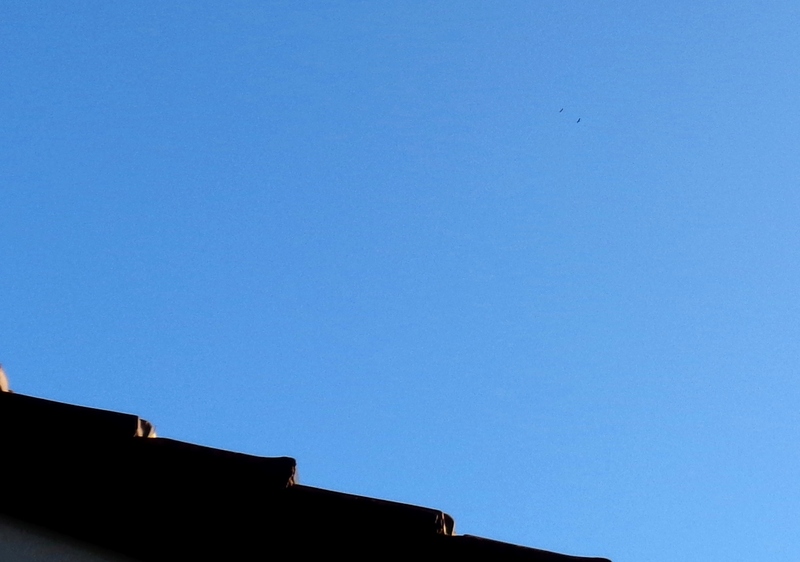 From my house, trees obscured the site of the fire, but seconds after sending the request to star family, two eagles appeared above the house, flying from the south, and stayed hovering over the roof for the next ten minutes. With the eagles came an inner message that two ships had been sent to the fire, and the wind also dropped. Within a few hours the fire had been put out, and I learned from Rob and Shelley that they had done the same thing, putting protections around their home and our area and calling on star family for assistance. From their angle, Rob was able to photograph in the direction of the fire, and two small ships appeared in his pictures, near emergency services helicopters. Here’s one of his photos. Photo courtesy of Rob Hartland, Jan. 22, 2016. See Rob & Shelley Hartland’s site wispyclouds.net for more of their photos. The next morning I heard fire engine sirens and helicopters again, and realized they were over the same area, and embers must have still been burning. 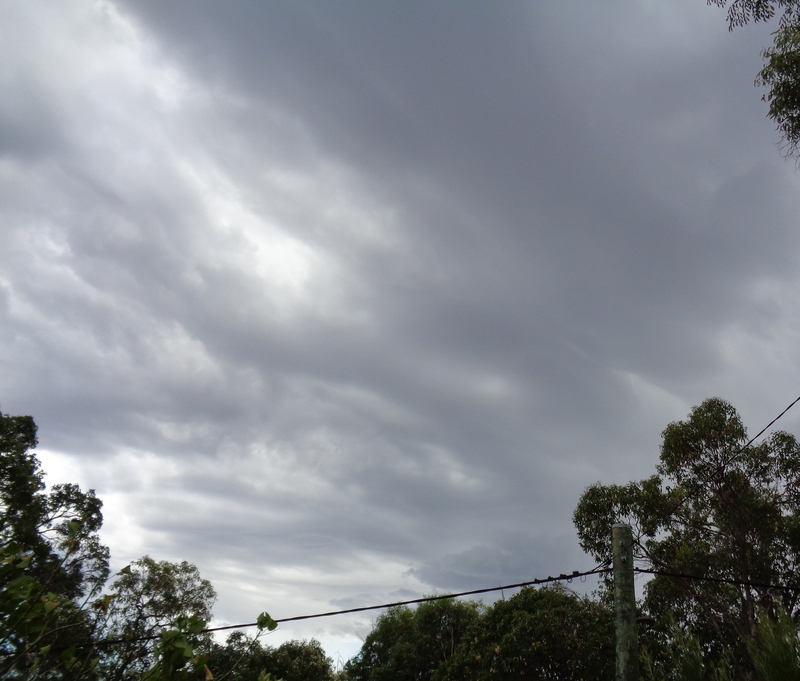 This time I went into Inner Heart meditation with Gaia and the undines (water elementals) and asked for rain, as the day was again clear with a forecast for dry high heat. 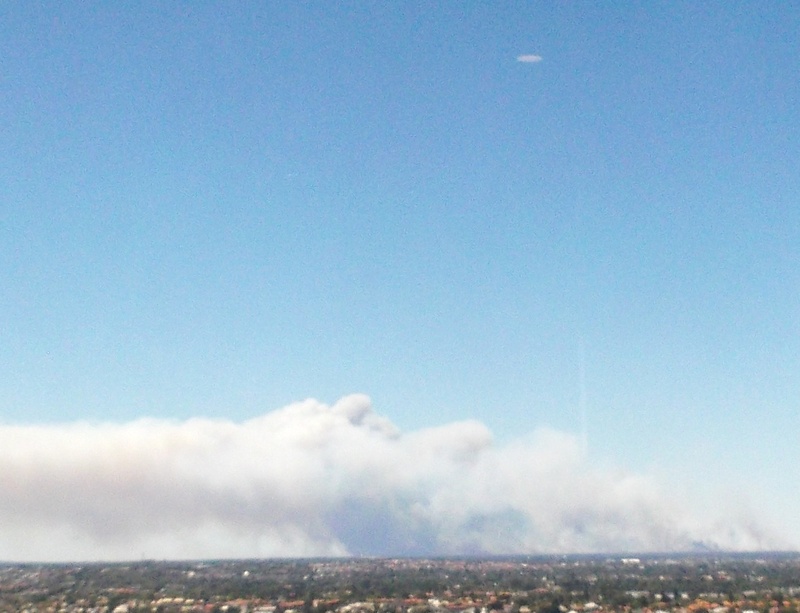 Within the next half hour, a patch of storm-clouds built up and moved right above the fire site. I could see blue sky on either side with a storm in the middle….and an eagle flew in this direction right in front of the clouds. 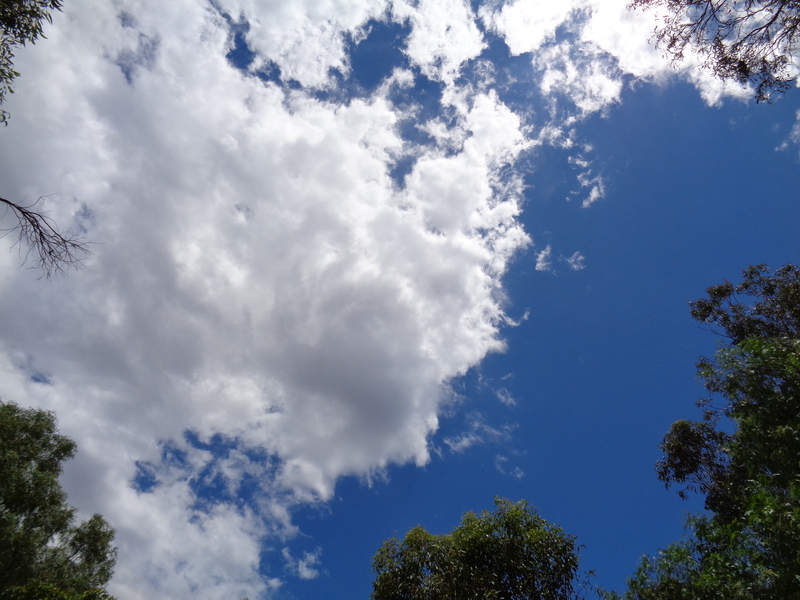 Rain poured down torrentially for about 15 minutes, soaking the earth, then the clouds dissipated and the sun shone again. 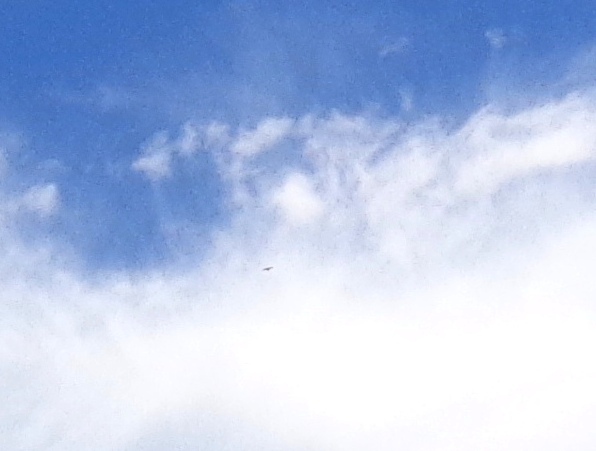 The helicopters circled a couple of times before leaving, and I imagine the pilots flew away mystified, but relieved! The second fire, on March 2, was preceded again by seeing the black goanna with its odd curled tail again (I’ve never seen it again, and feel that energy has departed). This next fire was smaller, not far from the first one but close to houses. I asked star family for assistance again, and knew Rob and Shelley would do the same, and extend protections around the area. Rob was able to take the superb photos below, of a very clear small golden-coloured star family ship passing a helicopter. Photo courtesy of Rob Hartland, taken March 2, 2016. This time the fire was put out quickly, without needing rain to damp it down, thanks to our emergency services – with a little higher dimensional back-up! 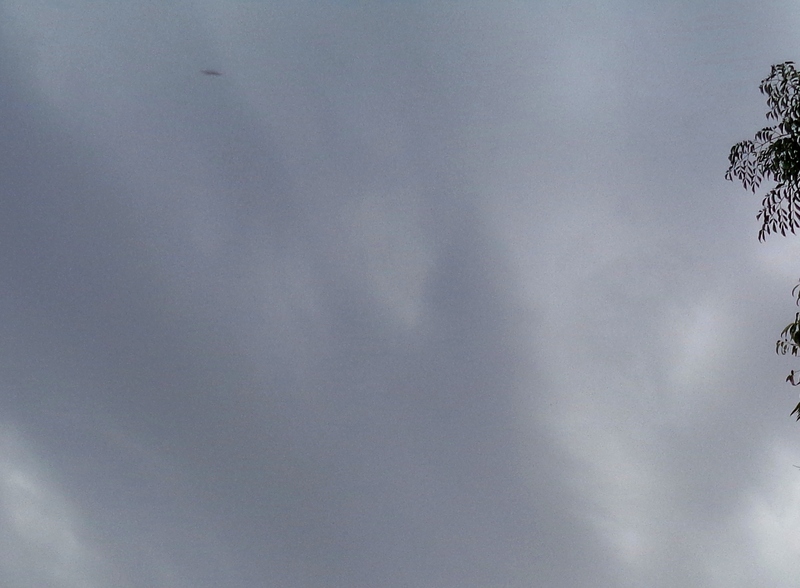 I asked for a deep clearing of the energies behind these fires, and it was the next day, March 3, that Ashura (my Twin Flame) sent this visual message of an eagle flying straight through a disc-shaped hole in the clouds, with his face visible in the clouds nearby…a message of love, and an ‘all clear’ from the fleet. 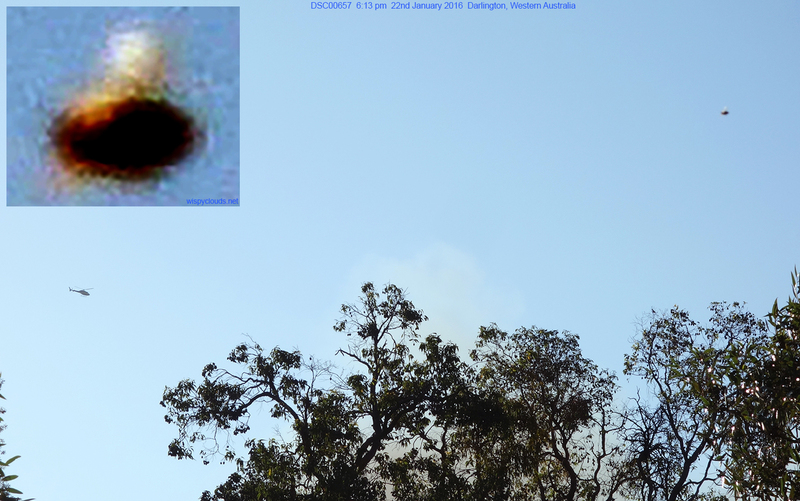 To bring this full circle, on January 10, 2015, I took a few pictures of the ship Ashura captains, the Shem Arua, uncloaked in its white light for the first time in photos, after asking if they could assist with a major fire burning north of Perth, visible from the building I was in at the time. I hope this post conveys something of the beautiful interactions and interweaving our intentions and visions based in love can have with this planetary soul Gaia, with star family and elementals, and in fact with all Life, here and everywhere in the Universe/s. It is also important to state that this way of being, serving and co-creating with/in the higher dimensional frequencies and converging them with/in the third dimension, is in harmony with Source and with our soul when it flows from unconditional peace, trust and love for ourselves and all… when we’re in resonance with our higher selves, and therefore with our brothers and sisters across dimensions, as family and true friends. True connection doesn’t need to control (seek to bend or influence energies by force of will). It allows, senses, attunes, trusts, flows with and through the natural affinity inherent in us all, to the energy of life. 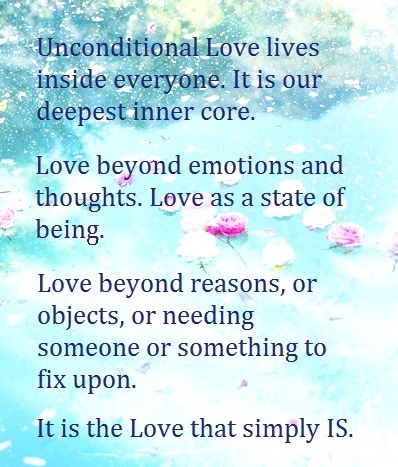 The deep magic of life is Love, beyond thoughts, emotions or things, yet flowing through them….always. With Love to all, thanks to Ashura & star family, to Rob & Shelley Hartland, to the elementals, Gaia, and all beings holding the light of love around this planet while its Shift continues. 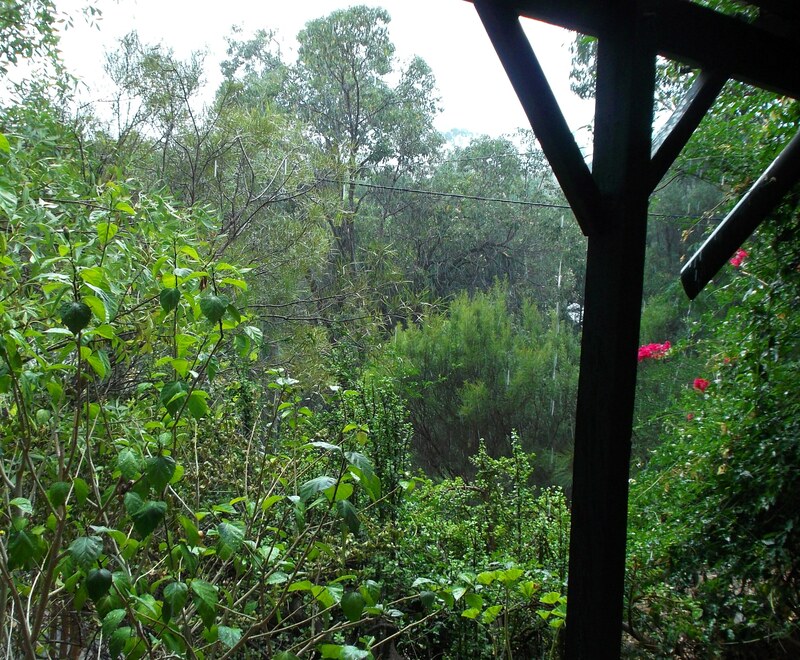 We’ve had a fortnight of extreme weather here in south-western Australia, which I’ll speak of now in relation to connecting with our galactic family, and inviting them to act. As I experienced it, these weeks exactly symbolized energies that have been laid in throughout 2014 – culminating at the close of this Chinese Year of the Horse and opening the Year of the Sheep/Goat. I’ll recap briefly here the energy that built through the last year, and the stage of the Shift we’re in now, which asks and offers deeper centering, peace and heart-connection to all anchoring Love within themselves. A couple of years ago I had a dream, in which a crowd of people in a field looked up at the sky, and Sananda (in his Jesus form) stood in the air between the two words ‘Alpha’ and ‘Tau’, written either side of him (the Hebrew alphabet began with Alpha and ended with Tau; three extra letters were added to the Greek alphabet, ending with Omega). This was followed by dreams of a planet of Tau Ceti, in the Whale (Cetus) constellation. 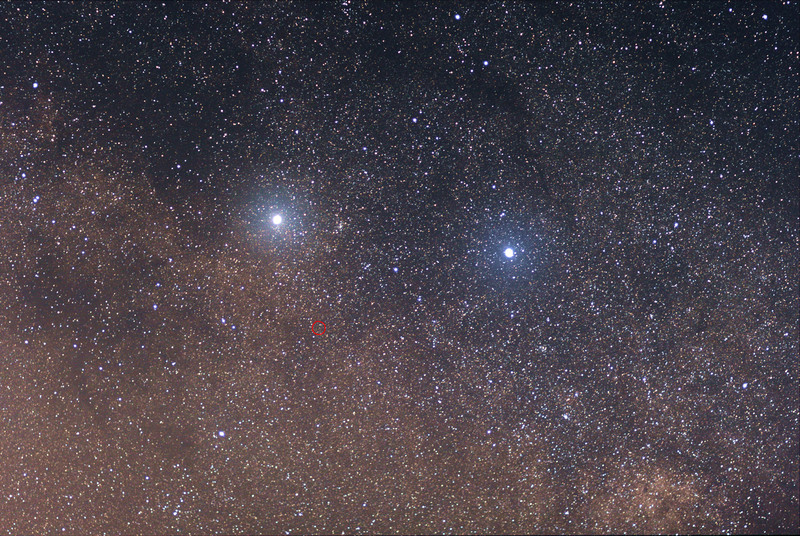 and I was guided to focus on Alpha Ceti also, and the red/orange star moving between them – Mira ‘the Wonderful’ (Omicron Ceti), which forms a beautiful ‘bow’ of light and a 13 light-year blue-white tail. 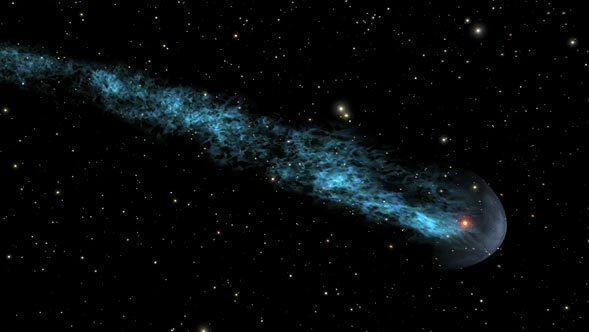 Mira, red star/seed within the shielding bow, with a blue-white 13 light year tail. Image: NASA. 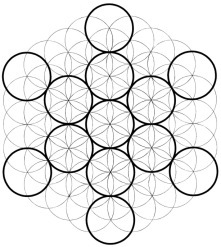 13 is the Feminine/Mother energy of Source, the wrap of the petals of the Flower of Life. The Seed of Life, the Masculine energy, came through with the blue-white comet ISON and the higher dimensional biosphere (egg) from Cygnus, the Swan constellation, ‘wrapping’ it. 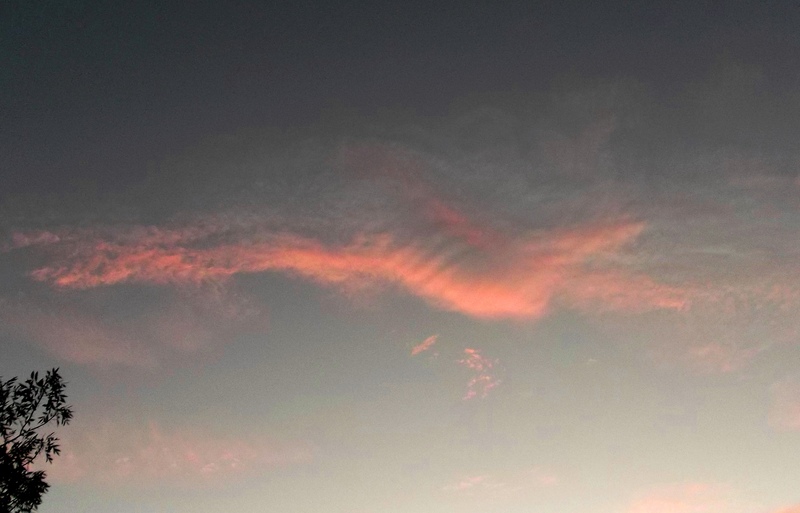 Sky sign Jan.22, 2015: The Swan flies to the south while the Shem Arua (starship) was behind me, to the north. ‘The Gates are open.’ Circle of the Northern Cross-Southern Cross is unified. The next stage, the flowering, has stepped through several stages to lever the gate open into 2015, taking the cycle of Ascension seed>flower>fruit up another vibrational notch. From Mira’s bow, grounding of the new life force energies begins to flower. Feel this in your heart; between the Alpha and the Tau, beginning and end, the divine child/rebirthing energy/resurrection shoots through the Mother’s Bow. Cellular ‘grails’, receptive DNA strands, soak up the new energy, elixir of Life. Gaia is anchoring the same energy, which has been pressed through, slipped under the magnetic/chemical/astral fence, by our friends of another binary star system, the Alpha Centaurians – Alpha and Beta Centauri flowing the balance of blue-white/feminine and red ‘bull’ energies, as spoken of in previous posts (Alpha Centauri was seen/felt as a Bull in the ancient middle east, then as Centaurus, which means ‘new bull’). Je’errne’on, my Alpha Centaurian contact, sends a message of thanks to all on Earth who have persevered, pillaring and anchoring the Light into the heart grid ~ which allows star family to take deeper steps in. Aldebaran (alpha star of Taurus) and Capella, were once the twin pole stars of Earth, thousands of years ago, before the planet’s axis shifted toward Polaris…and have a similar vibrational relationship to Alpha & Beta Centauri. Aldebaran, Alpha star of Taurus, with the Hyades cluster, lower right. Image: wikipedia. 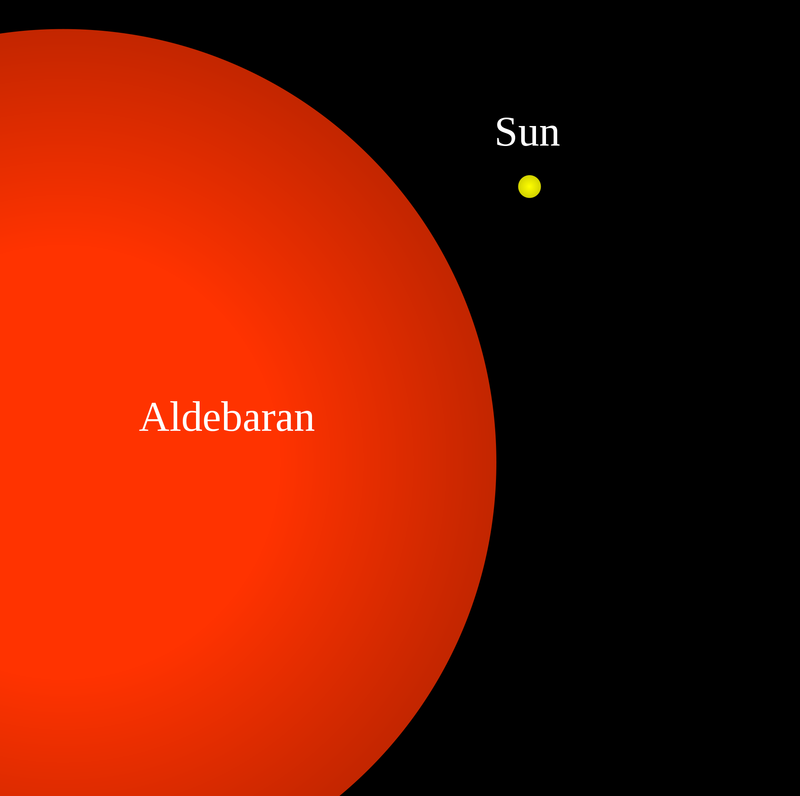 Aldebaran (Alpha Tauri), big red star. Feel this function of the Alpha Centaurians’ light spheres, being anchored in/around the Earth, and ushering in the light of Aldebaran now – as a ‘guest layer’ securing and holding the 5D unity grid until it is firmly in place here, simulating, activating, enacting and equalizing the higher frequencies as a proto-template with Gaia, while humanity adjusts UP enough collectively to maintain it autonomously. And feel how the Bull brings through the Divine Feminine, crowned in her ‘crescent’ horns. Returning to the start of this post, and the weather, the incoming Light puts pressure on resistant old energies – individually, collectively and planetary. 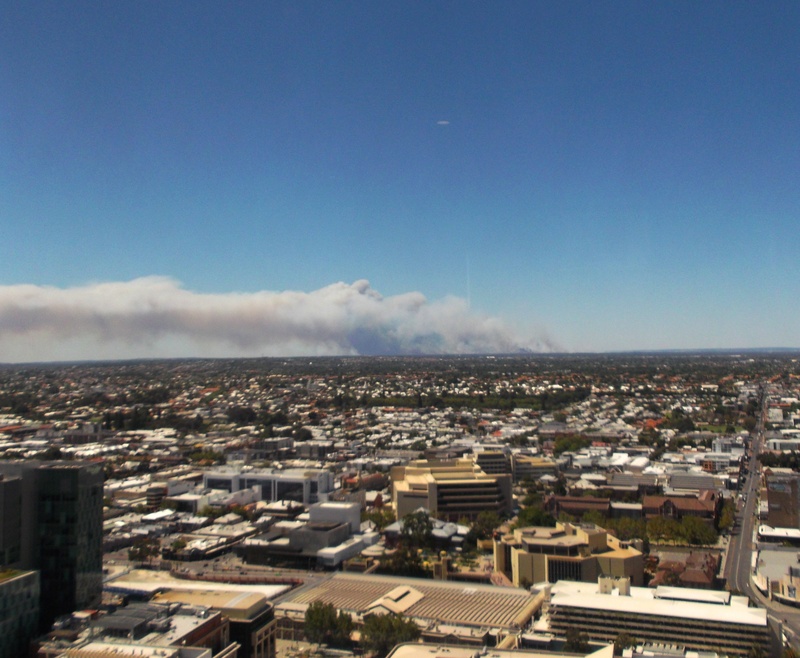 Here, the ‘friction’ has ignited intense fires – the biggest bushfires ever recorded in Western Australia’s southwest (with much courage from firefighters and evacuated communities). Smoke is heavy in the air as I write, and I’m asking Gaia, the sylphs and undines for another cleanse, after rain came last week. The first ‘friction firing’ started on January 10th at Bullsbrook (note the name) north of Perth. As it happened, it was my son’s birthday, and we went to a restaurant on the 33rd floor of a building in the city, from which we had a clear view of the fire. From our arrival there, I felt the Shem Arua close by over the city, and sent a request to Ashura (its captain at the time, through his 5D form Arnap) and crew to help with the fire as much as possible. I took this series of photos of the fire a few minutes later, with the Shem Arua above the ignition point of the blaze, at Bullsbrook. You can see the ship in 3D, uncloaked as a bright silver-white disc, and a white pillar of light grounding into the dense part of the fire. 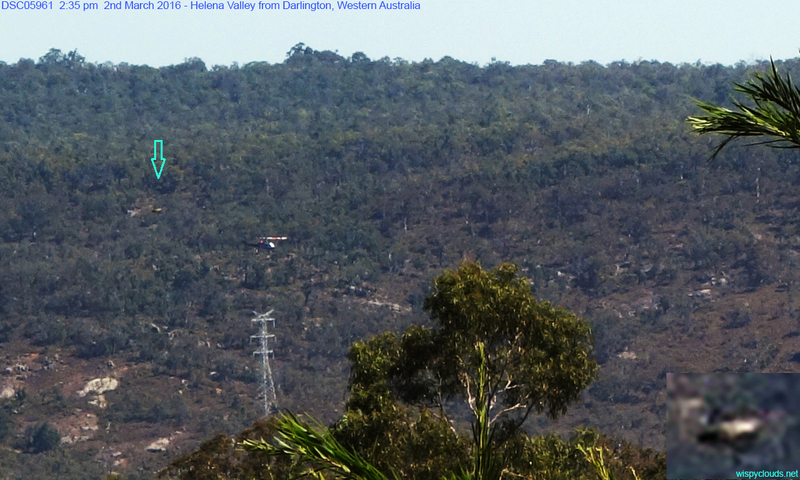 Photo taken Jan. 10, 2015, from Perth city. Close-up, Shem Arua and light pillar. Shem Arua above Bullsbrook, 42 kms away. 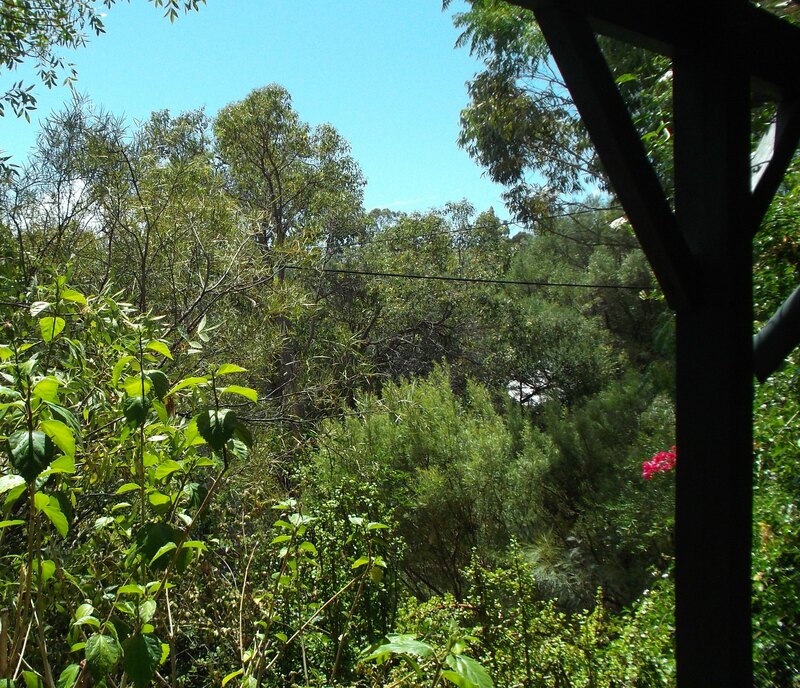 I had seen the Shem Arua once before, while driving down from the hills where I live toward Perth. It decloaked right to left, revealing the same silver-white disc shape as in these photos, then recloaking left to right (which simply means, bending the ultraviolet wave-forms around the ship). Shem Arua heading slowly west. A friend who lives west of the fire site said later, she felt a clear message that the area she lived in was safe. The fire got into pine plantations but was stopped before reaching the major residential area. Shem Arua, heading slowly west over the fire. In the last photo, the ship was ‘recloaking’ (ie; modulating the frequencies of its light-field), with half the disc still exposed. It was visible for several minutes (for anyone wondering, this wasn’t a dust speck or light flare on the window, as the restaurant was revolving, and I took these photos through three windows at different angles to the sun). I saw the Shem Arua hovering about 300-400ft above Perth in early December, 2014, while driving down from the hills east of the city. The ship decloaked and recloaked exactly as seen in this photo taken Jan. 10, 2015. 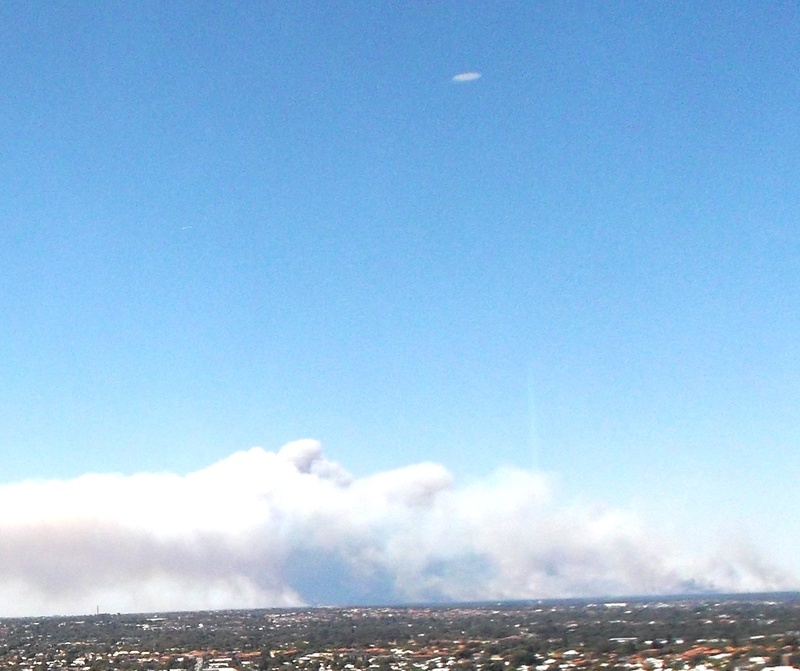 The Bullsbrook fire was contained, but during 5 days of massive thunderstorms, many fires ignited from lightning strikes. 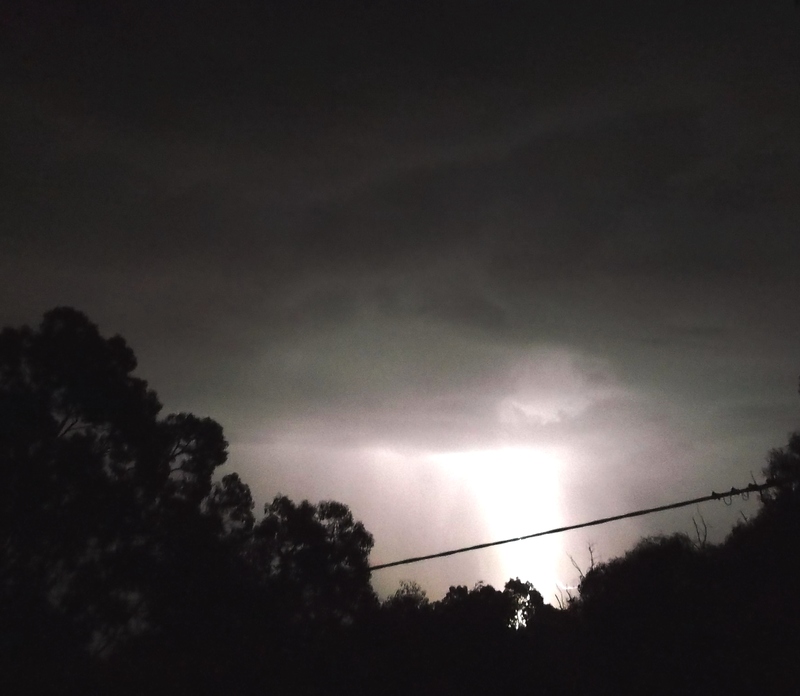 At one stage, while standing outside I watched lightning flash every 1-2 seconds for half an hour, before witnessing a mighty ‘light pillar download’ followed by drenching rain that kept the eastern hills area safe. 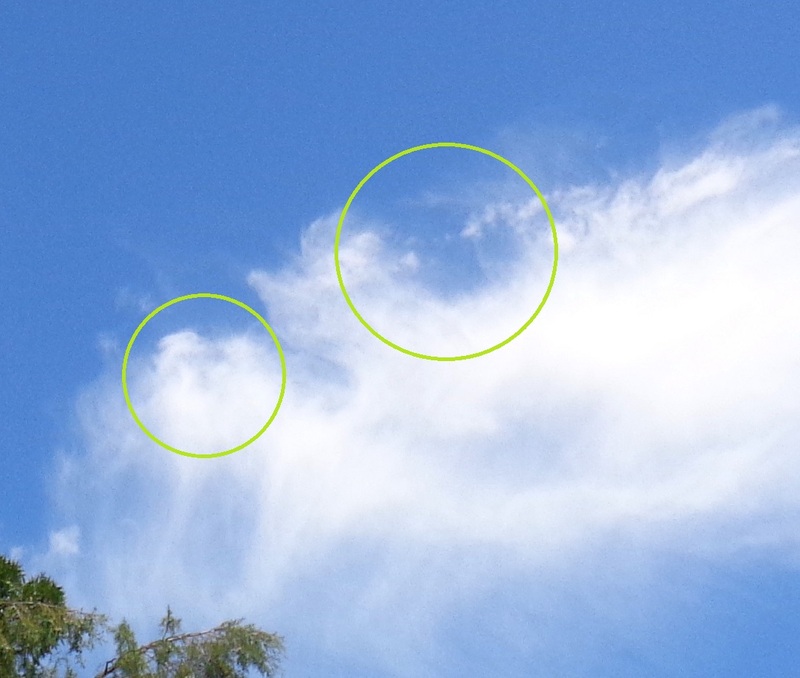 In the photo below, you may be able to discern the form of a ship, above and slightly to the left of the ‘download’, as a winged disc shape, or crescent with a central ring – an Arcturian form – just underneath a giant V in the clouds. 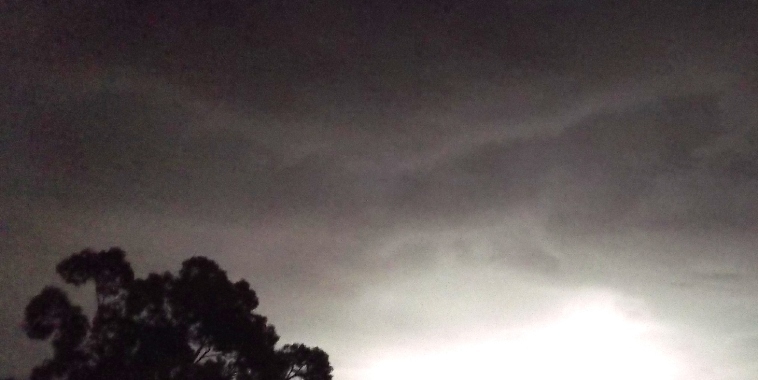 Photo take Feb.2, 2015, crescent/bow-shaped ship just above the light column, slightly to the left. 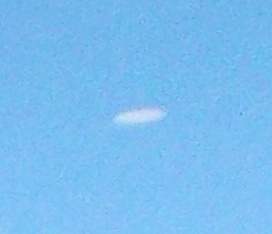 Close-up of crescent/bow/winged disc-shaped ship. 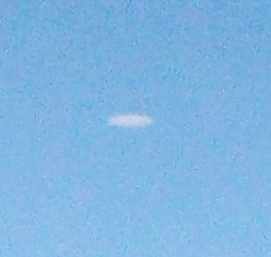 Massive open ‘V’ or boomerang shape in the clouds from which the bow-ship descended. V stands for Vega and the Ashtar Command. 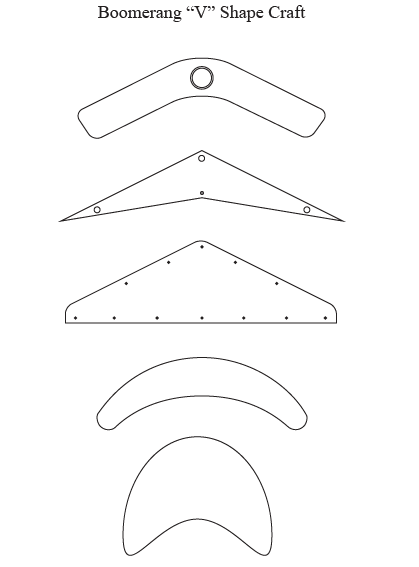 Boomerang, crescent and bow shapes as reported by UFO witnesses. Image sourced from the internet. Crescent/bow ship with central disc, as reported by Kenneth Arnold in 1947. 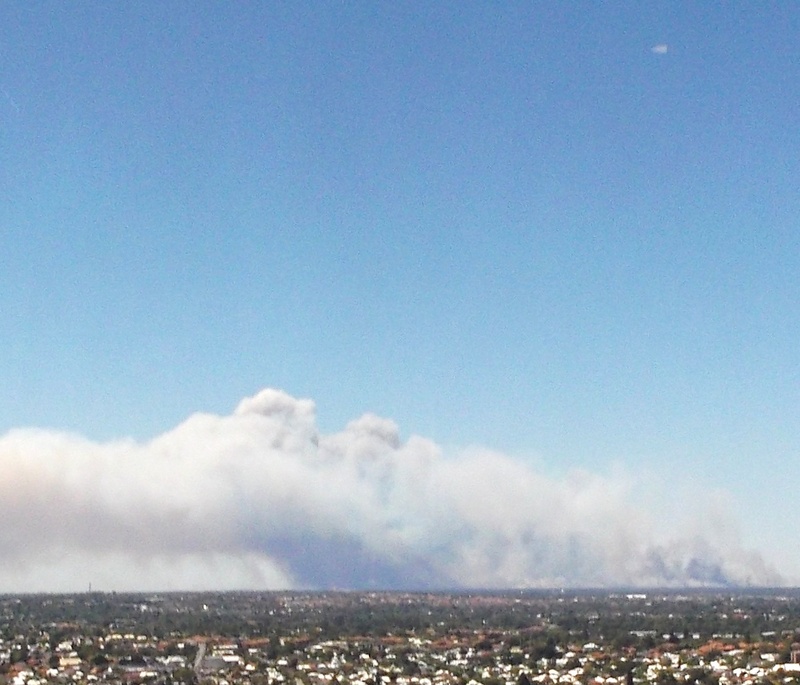 By the next day, a town south of Perth had been declared indefensible from the fires and its people evacuated. The fire department stated it could burn all summer, then that night unforecast heavy rain fell, miraculously, and fire squads were able to contain the blaze. I know many souls would have been praying for rain, rain-dancing, calling on Gaia and the elementals, to bring about this downpour. Thanks go to all your hearts, and to all reading this, please work with Gaia in your hearts, and know you can call on the elemental beings and our star families too – invite them to act. Whether or not you can see their ships or light-forms, or have conscious contact with them or not, they are well aware of us, and feel all thoughts put forth for the highest good, for Love. Above all, they are very glad to help! 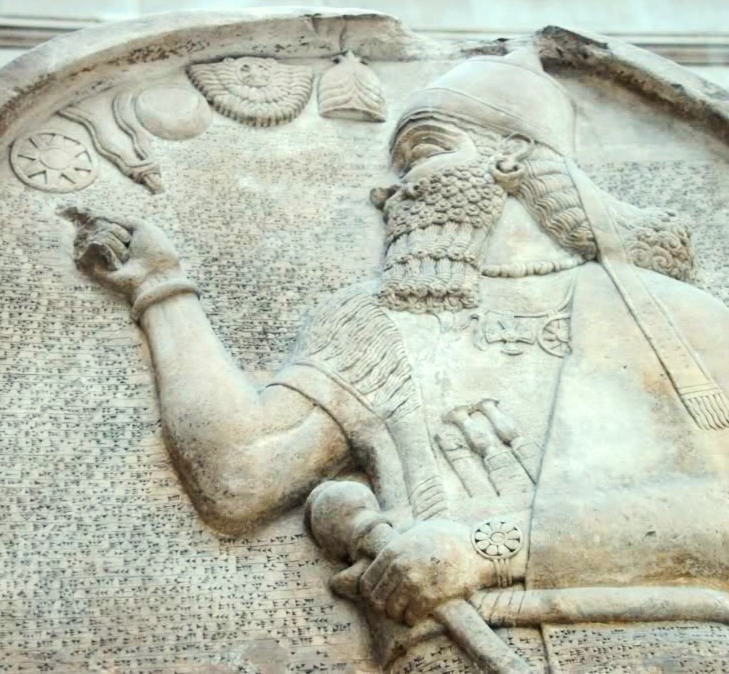 With this phase of the Light’s inflow through 2015, and Ashura (Arnap in 5D) gives this guidance, through his soul expression remembered as Ashur, solar deity of the ancient Assyrians. 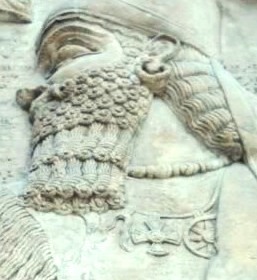 In the stela below, ‘Ashur’s heir’ points to an arch of five symbols: Sun(Star), Taurus/Bull’s horns, Moon, rayed Lion’s face, and an Akkadian/Hittite-style Crown, topped with a three-petalled Lily. Ashurnasirpal stela, British museum, with stellar/solar/lunar symbols and Akkadian cunieform script. Following the sequence from lower left to upper right: the Gate of the Sun has opened >> the Bull (Cetus – Centaurian – Aldebaran) energies have arrived >> they will continue to flow in until the next Blood Moon (April 4th) >> anchoring and bedding the light through to the Lion’s Gate (July/August) when the golden leonine energies will amplify, through to the final Blood Moon (of the tetrad of lunar eclipses of 2014/2015) on September 28 >> then begins the flowering of the Lily, the three-petalled Trinity Crown, toward Christ Mass, the birth of that which is immaculately conceived (higher self merging within us). 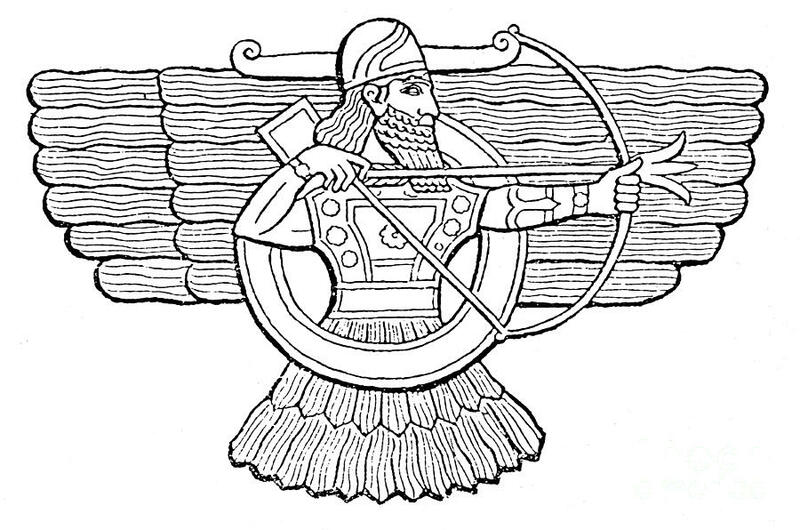 Ashur, in the winged disc, aims the Trinity Lily through the Bow. Of reception of Christ Consciousness, feel into this phase as the crowning of the head of a baby during birth – the beginning of the ‘new child’ emerging from the birth canal, from INception of the Seed of Life: the internal ‘immaculate conception’ of absorption of the Word/Tone of God/Source by our DNA/RNA, in the tiny wells of our cells >> to the growth, the opening, the Flowering >> to release the fully-formed Fruit/baby self, with our 12 strand light-DNA blossoming through the ’13’ of the Mother, each strand ‘twinning’ (twining) the binary (physical) and Fibonacci (higher frequency) modes. Fruit of Life, arising from the Flower of Life, 12 spheres arranged around the 13th. See Drunvalo Melchizedek’s book, ‘The Ancient Secret of the Flower of Life’ for more info. 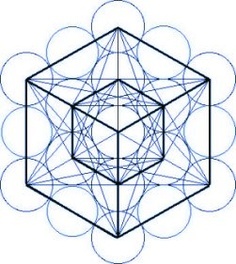 Metatron’s Cube on the Fruit of Life; physical light body (the baby self) ‘built’ with the INception of higher Light/Christing energies into the cells. Ashura’s 5D name ‘Arnap’ translates as ‘One who steers (through) the Bow‘. ‘Steer’ has a double meaning, both guidance, and as another word for ‘bull’. Feel the steering in of the Cetian, Centaurian and Taurean star family flows. Currently, I see many ‘horseshoe’ ships around the Shem Arua, like petals around a sun – a very beautiful reunion of leonine and angelic, human…and ascended carian-human souls of the ‘New Bull’ constellation, for a common mission, steering in love. We’ll go into more depth about the passage of the Blood Moons and solar eclipses, during the year. For now, note the symbolism of the necklace below, the tetrad cross between the Sun/Star and Taurus/bull horn pendants, representing the tetrad of lunar eclipses. X marks the spot. Sun-Star, Tetrad cross, Taurus horns, Crescent Moon. 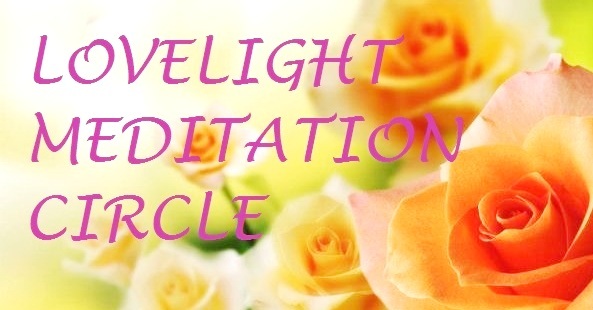 If you’re finding the incoming flow over-intense, shaking your centre or ‘firing you up’ (anger/friction/headaches/dizziness/restlessness/emotional imbalance etc) we recommend visualizing an ‘individual size’ light sphere, Alpha Centaurian style, with red/grounding light in the base and white ascension light in the upper half. 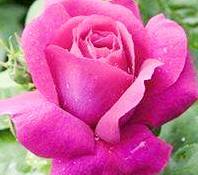 Put this around you, breathe deeply into your Heart, let a pink star radiate from your heart and infuse your light sphere, until the red base light turns a rose colour, in peaceful union with Gaia’s Rose Heart balancing the chi/red life force and folding in the white light of Ascension. This is you. A perfect container and conduit of grounded, anchored high frequency Light, each cell in your body a grail cup, each ion a well of golden merkaba spinning light of Love. Breathe. Relax. BE it. * A page about the Shem Arua can be found here.